The 50th anniversary of Sergeant Pepper’s Lonely Hearts Club Band was much celebrated in 2017. But this Christmas also marks 50 years since the release of another Beatles production that received much less critical acclaim – the Magical Mystery Tour film. Much of the music within it was produced during a particularly fecund period (even by the Beatles’ standards) and is, or course, peerless – from the music hall echoes of Your Mother Should Know through the plaintive, melodic Fool on the Hill to the boundary breaking I Am the Walrus. Unfortunately the film itself fell far short of that artistic bar. First broadcast on Boxing Day 1967, it is, to put it mildly, seriously flawed. Incoherent, sexist, technically shaky and verging on boring, history hasn’t been kind to its cinematic qualities. We don’t say it was a good film. It was our first attempt. If we goofed, then we goofed. It was a challenge and it didn’t come off. We’ll know better next time. Matters weren’t helped by the Beatles’ psychedelic, colourful exploration being broadcast in black and white on BBC1. A repeat on BBC2 (then the only colour TV service) a few days later did little to redress the situation, if only because there were fewer than 200,000 colour sets in the UK at the time. For all the defensiveness of McCartney’s response (“You could hardly call the Queen’s speech a gasser”) they do point towards some retrospectively mitigating aspects of the Magical Mystery Tour film. The film’s distinctly British surrealism and cavalcade of barking sergeant majors, fat aunts, dolly birds, wacky racers and midgets clearly prefigured Monty Python’s explosion of absurdity into mainstream television. Indeed, George Harrison said later on that he saw Monty Python as a continuation of the spirit of the Beatles. 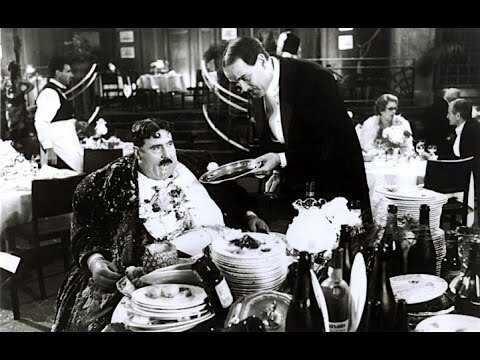 He also funded some of their films, including The Meaning of Life – whose notorious Mr Creosote sketch has visual echoes of a scene in Magical Mystery Tour where John Lennon, dressed as a waiter, serves pasta to Ringo’s fictional Aunt Jessie by the spade full. What the Pythons added to the mix were sharply honed scripts. Magical Mystery Tour, by contrast, was almost entirely ad-libbed from a one-page diagram. The Beatles’ skill as writers and arrangers was poured into their music instead. Something else the Pythons had, and which the Beatles lacked, was the benefit of Oxbridge educations. Magical Mystery Tour’s sensibility was more rooted in working class entertainment and tropes than the Pythons’ Oxbridge-infused references. The very concept of a coach journey – albeit one largely filmed at a decommissioned RAF base – was based on the “charabanc” trips (group bus excursions) of the band members’ childhoods. The film evokes the past – both a British past in general and, more specifically, as filtered through the Beatles’ own histories. It certainly shows them pushing the boundaries of what a rock band of four Liverpudlians (whose post-school education essentially took place in the nightclubs of Hamburg) could attempt, both artistically and institutionally. Their commercial and creative clout allowed them to broadcast the film during a key annual peak slot for British television viewing. Magical Mystery Tour occupied a particular space in the history of mass entertainment – from the “end of the pier” shows, through the Donald McGill postcards that George Orwell defended against artistic snobbery, to the anarchic weirdness of the likes of Mr Blobby on Saturday night TV. The Beatles infused that particular strand of entertainment with the forward looking experimentalism of their music, while retaining a characteristic, widely recognisable Britishness. It was this that paved the road for Python and others to follow. That Magical Mystery Tour was their first real failure since breaking through into the mainstream was also partly a matter of practicalities. While still flowering creatively, they were logistically rudderless after the death earlier that year of their manager Brian Epstein. Their lack of understanding of the demands of editing a film foreshadowed their later business-related shortcomings, notably the Apple boutique and record label. If the latter of these was revived to become the familiar Beatles brand of today, it was initially a costly failure that contributed to the band’s demise. But while the film may have overreached, it still demonstrates a clear broadening of mainstream creative boundaries. Popular music fans were certainly receptive to their successful experiments. And even if the broader television public was less ready for a caustic, psychedelic vision of Britain in prime time during the Christmas holidays, Magical Mystery Tour still stands as a useful cultural document. The Beatles being what they ultimately became, there’s much to be gleaned from their falls as well as their flights.